Planning an engagement can be a really exciting experience. There are many details to attend to in order to get the perfect setting for proposing marriage to someone! From setting the mood to saying just the right words, there's no detail too small for a proposal. Some people like to make the proposal a public display. Flashing "Will you marry me?" on the Jumbotron at a sporting event, or even climbing on stage during a concert to pop the question require equal doses of guts and preparation. If all goes well and the proposal is accepted, having the public witness the moment is sure to create a lasting memory for the couple. Other approaches to proposing can be much simpler, yet just as special. You could, for example, design your ownengagement ring. In all reality, the ring often says it all! Going out of the way for a big public proposal may mean nothing if the ring isn't the perfect symbol of everlasting love for the couple. 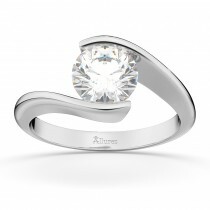 Retailers such as Allurez.com have designed a streamlined guide for consumers to design their very own rings. This lets the buyer design a unique creation that will be a symbol of their love and commitment forever. Those fine details of choosing the right diamond setting, band, and style are not just about making a beautiful piece of jewelry, but about personalizing the piece to suit the person wearing it. That is remarkable way of showing one's love and devotion for another. The ring on the left is absolutely stunning--my favorite precious stone is sapphire and set with the diamonds it is simply magnificent and sets off the sapphires perfectly. That is in fact an awesome idea, designing your own ring! 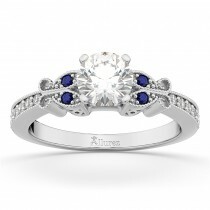 It would be really awesome to design my own engagement ring and eventually wearing it! Designing your own engagement ring adds excitement. I love when you can design your own, it is your special day you do not want a ring like everyone elses. I love that first design in the photo! Both rings are simple elegant and i love it silver!